Companies of all industries and sizes are in the midst of a groundbreaking revolution, driven by connected customers who expect personalized and consistent experiences across every channel. 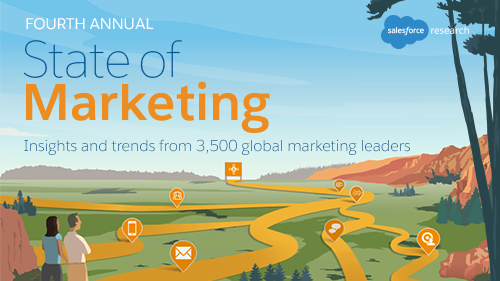 Released today, the 2017 Salesforce State of Marketing report found that creating customer journeys augmented by artificial intelligence (AI) to meet these expectations is a major element of high performing companies. Based on a survey of 3,500 marketers worldwide, the report revealed marketers are making investments to deliver a new gold standard for customer journeys, in which AI is applied to learn from a customer’s past interactions and deliver a true 1-to-1 communications experience. In fact, 57 percent of marketing leaders surveyed say AI is absolutely or very essential in helping them achieve this goal, and 64 percent say their company has become more focused on providing a consistent experience across every channel as a result of changing customer expectations. Why is this important? More than half of consumers said they are likely to switch brands if a company doesn't make an effort to personalize its communications to them. That number jumps to 65 percent for B2B buyers. Let’s take a deeper look into these trends. AI is helping marketers better understand customer behavior so they can determine the optimal message and the best channel to deliver it. Organizations that are investing in AI to drive recommendations and predict outcomes are already seeing real results. High performers are 2.2 times more likely to use AI in their marketing campaigns than under-performers. About 50 percent of marketing leaders are already using AI, with more than a quarter planning to pilot it in the next two years. 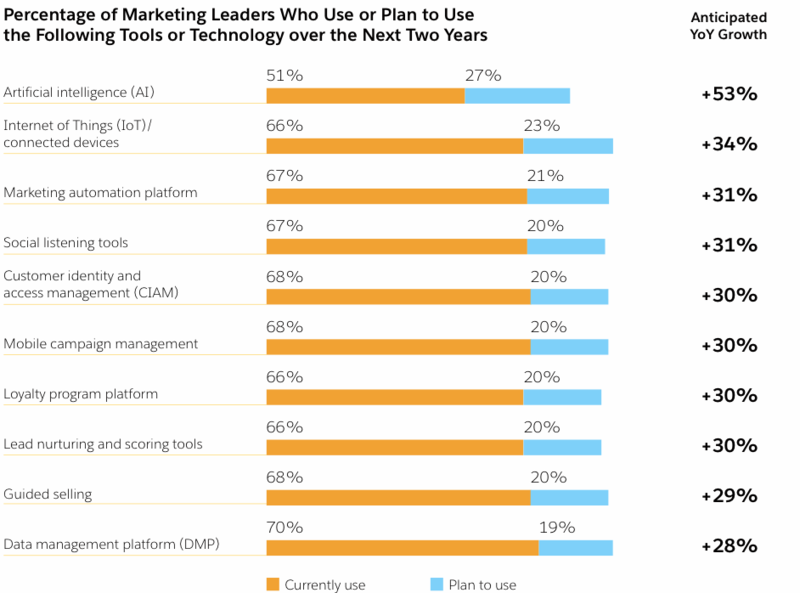 In addition, almost three-fourths of high performers say that they are already using AI technology in their marketing programs. Fifty-seven percent of marketers using AI say it’s absolutely or very essential in helping their company create 1-to-1 marketing across every touchpoint. Internally, marketers see AI as a means of creating more efficiency in their operations—59 percent say it will increase productivity. In terms of customer-facing benefits, most view AI as a way to get more from their data and personalize their marketing without burdening their teams—61 percent say it will help them with the “hyper-personalization” of content and dynamic landing pages . The gold standard for delivering a personalized customer journey requires that each interaction builds on and is contextually aware of every antecedent customer interaction. However, with more data and channels available than ever before to engage a customer, marketers are having a difficult time unifying data and gaining a single customer view needed to deliver on this vision. 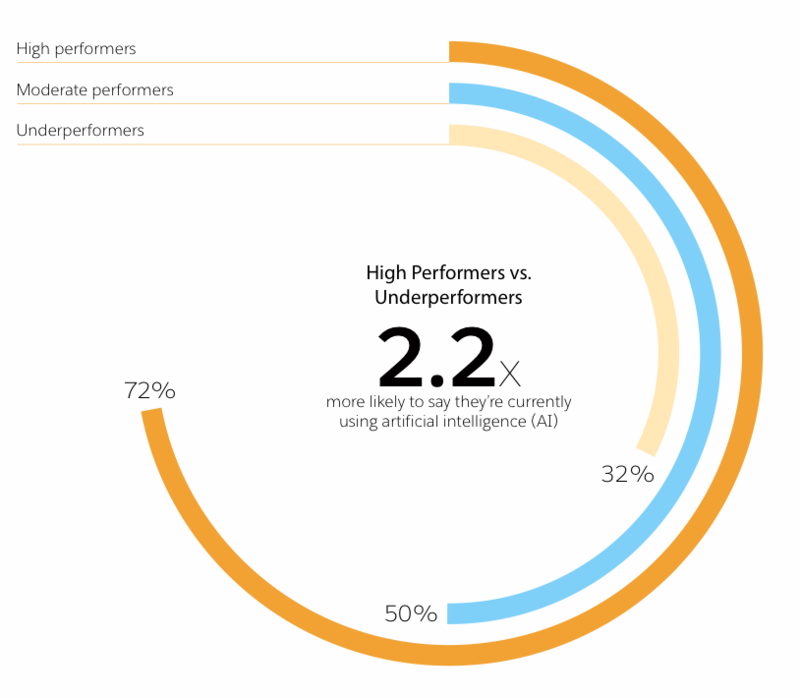 Ninety-three percent of high-performing marketers say they are extremely or very satisfied with their ability to create a shared, single view of their customers, versus only 24 percent for underperformers. Sixty-seven percent of marketing leaders say creating a customer journey across all touchpoints and channels is critical to their success, but only 23 percent are extremely satisfied with their ability to leverage customer data to do so. On average, marketing leaders today say 34 percent of their budget is spent on channels they didn’t know existed five years ago--and they expect that to reach 40 percent by 2019. Providing a personalized customer experience throughout the customer journey has expanded outside of just marketing to include commerce, customer service and more. In addition to taking steps to improve collaboration with other departments, successful marketers are evolving their own departmental structures. Eighty-nine percent of top marketers are aligning their marketing roles to a customer journey strategy, focusing on holistic acquisition, onboarding and retention strategies, versus traditional roles defined by channels such as email or social. Sixty-four percent of marketing leaders believe customer journey strategies require organizational shifts, and are working to redefine how sales, service and marketing teams work together. Top marketing teams closely collaborate with sales and services teams, and value two-way communication. High-performing companies are more than twice as likely than underperformers to say marketing consistently provides sales with quality leads, more than twice as likely to alert customer service to special offers and promotions, and 2.5 times more likely to suppress marketing when a customer has an open service case. As the lines between marketing and customer service blur, 88 percent of high-performing marketing teams work in tandem with service to manage inquiries and service requests from social media channels. This compares to only 37 percent of under-performers. Marketers are investing in new technologies in order to stay ahead of competitors. The biggest growth in marketer's technology usage is in emerging areas, such as AI and the Internet of Things (IoT). Top performers also identify data management platforms (DMPs) as the most essential technology to deliver personalized marketing. Sixty-six percent of marketers work with IoT/connected devices and 23 percent plan to do so in the next two years. Successful marketers leverage a range of marketing technologies to deliver targeted and personalized experiences to customers. Top performers are 14 times more likely to be heavy technology adopters versus under-performing teams. High-performing marketers say the most essential technology to achieving 1-to-1 marketing across every touchpoint is a DMP. Leading teams are 4.3 times more likely than underperformers to extensively use a DMP. This study was conducted by Salesforce Research through a third-party survey firm in April 2017. Three thousand-five hundred full-time marketing leaders in Australia, New Zealand, Brazil, Canada, France, Germany, Japan, Netherlands, U.K., Ireland and U.S. were surveyed. Respondents were segmented into high-performing, moderate-performing or under-performing groups. High-performing organizations are defined as those who are "extremely satisfied" with the current outcomes realized as a direct result of their company's marketing investment.